Saludos todos! This week I will be reviewing Moví la mano/ I Moved my Hand, written by Argentinian author Jorge Lújan and illustrated by French artist Mandana Sadat, as our last January book on “unsung heroes.” So far this month I’ve reviewed children’s books that focus on heroic and fearless parents, lesser-known cultural icons, like Tito Puente, who were also active humanitarians, and brave firefighters whose invaluable work sometimes goes unnoticed. However, this week’s “unsung heroes” are children themselves. Moví la mano/ I Moved my Hand tells the story of a young girl whose imagination, creativity and drive hold the power to change the world around her: “When a little girl moves her hand, she discovers the world and her power to change and create it anew.” Lújan’s story reads as a bilingual Spanish/English poem, complemented by Sadat’s stunning illustrations. Every one of the female protagonist’s actions, moving, shaking, stirring and swirling, to name a few, is met by a magical effect, the creation of a lake, finding the moon, and soaring through the sky. This fantastical narrative and its equally enchanting illustrations serve as a metaphor for the infinite potential at the hands of young children: “an empowering and inspiring tribute to children’s magical possibilities.” As a result, this beautiful book helps us honor and celebrate the infinite potential and imagination of young children, the “unsung heroes” of the future, as well as their magical ability to find and create beauty in the world around them. Saludos todos and welcome to the start of our November-themed book reviews! Our themes for this month will focus on food and the cultural importance of food, topics that seem to fit well with the harvest season that is upon us and the subsequent winter holidays for which food plays such a significant role. Along with traditional practices, food is an important cultural element that can awaken the senses, harken back to fond memories and seasonal associations, and bring people together though collection, preparation, and shared enjoyment. Our book to start this exploration is The Cazuela that the Farm Maiden Stirred, written by Samantha R. Vamos and illustrated by Rafael López. This fun and engaging book tells the story of a young farm maiden who, by enlisting the help of various farm animals and the farmer boy, makes a steamy, delicious pot of arroz con leche. The book has a lively, festive tone and the cooking process is described as a fun, unifying celebration, emphasizing the cultural and communal importance of food. In preparing the arroz con leche, everyone at the farm, including the anthropomorphized animals, must do their part and contribute. This not only exemplifies good team work, but also shows how everyone has a valuable skill or asset to contribute. Saludos todos, and welcome to my first book review of the year! I’m thrilled to be back writing for the blog, and I’m especially excited for all of this year’s amazing books. This month we will be celebrating Hispanic Heritage Month while also drawing special attention to the renowned Pura Belpré Award, which recognizes outstanding works of Latinx children’s literature, and is celebrating its 20th year in 2016. The Pura Belpré Award is named after Pura Belpré, the first Latina librarian at the New York Public Library. In our celebration of this prestigious award and its recipients, we will also be celebrating Pura Belpré herself. I hope everyone is having a great week! Beginning this month, we will be bringing you our Reading Roundup list at the beginning of the month, so that you’ll have more time to include them in your classroom themes. Nonetheless, we hope you are able to incorporate these books into your classes all year long! As Keira explained in her Sobre Marzo post, we are celebrating Women’s History Month and I therefore present to you books with strong Latin American and Latina female characters While this list cannot possibly encompass all of the wonderful books out there with positive women role models, we hope that it can be a start. In addition, if you have any relevant books to suggest, please comment and let us know! In this Reading Roundup, we aim at encompassing a mix of both well-known and everyday women’s narratives. In addition, all of the authors are women. While the majority of these books do not delve deeply into the complexity of gender, gender roles and expectations are addressed in a few of the young adult books listed, like in Gabi, A Girl in Pieces and Under the Mesquite. We hope that you enjoy these books and find them valuable for your classrooms! 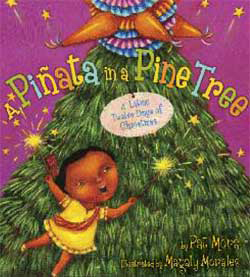 I realize it’s still November, but based on our search statistics, many of you are already looking for books, lesson plans, and resources for teaching about winter celebrations like Christmas and Las Posadas. I’m impressed! You all are far more organized than I was when I was in the classroom. You’ll definitely want to check out this week’s giveaway of Merry Navidad! In previous posts we’ve discussed our philosophy for how to approach teaching about cultural celebrations and traditions in a way that’s authentic and meaningful. Many of those same ideas are relevant here as well.